Pupienus (Latin: Marcus Clodius Pupienus Maximus Augustus; born c. 165/170 – 29 July 238), also known as Pupienus Maximus, was Roman Emperor with Balbinus for three months in 238, during the Year of the Six Emperors. The sources for this period are scant, and thus knowledge of the emperor is limited. In most contemporary texts Pupienus is referred by his agnomen "Maximus" rather than by his cognomen (family name) Pupienus. The Historia Augusta, whose testimony is not to be trusted unreservedly, paints Pupienus as an example of advancement through the cursus honorum due to military success. It claims he was the son of a blacksmith, was adopted by one Pescennia Marcellina (otherwise unknown), and who started his career as a Centurio primus pilus before becoming a Tribunus Militum, and then a Praetor. He was in fact part of the aristocracy, albeit a minor one, and possibly quite recently. Hailing from the Etruscan city of Volterra, it has been speculated that Pupienus was the son of Marcus Pupienus Maximus, a Senator who was the first member of his family to enter the Senate, and wife Clodia Pulchra. 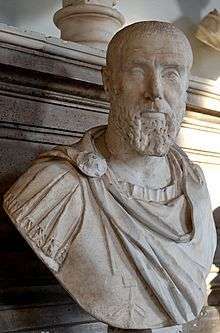 Pupienus’s career was impressive, serving a number of important posts during the reign of the Severan dynasty throughout the late 2nd and early 3rd centuries. This included assignment as Proconsul of the senatorial propraetorial provinces of Bithynia et Pontus, Achaea, and Gallia Narbonensis. He was later assigned as imperial legate to one of the German provinces, most probably after his first suffect consulship, circa 207 AD. During his time as governor, he was quite popular and scored military victories over the Sarmatians and German tribes. In 234, during the last years of Severus Alexander’s reign, he was installed as Consul for the second time. In that same year he was also appointed Urban Prefect of Rome and gained a reputation for severity, to the extent that he became unpopular with the Roman mob. When Gordian I and his son were proclaimed Emperors in Africa, the Senate appointed a committee of twenty men, including the elderly Senator Pupienus, to co-ordinate operations against Maximinus until the arrival of the Gordians. On the news of the Gordians' defeat and deaths, however, the Senate met in closed session in the Temple of Jupiter Capitolinus and voted for two members of the committee to be installed as co-emperors – Pupienus and Balbinus. Unlike the situation in 161 with Marcus Aurelius and Lucius Verus, both emperors were elected as pontifices maximi, chief priests of the official cults. the mind of Maximus [Pupienus] was formed in a rougher mould [than that of Balbinus]. By his valour and abilities he had raised himself from the meanest origin to the first employments of the state and army. His victories over the Sarmatians and the Germans, the austerity of his life, and the rigid impartiality of his justice whilst he was prefect of the city, commanded the esteem of a people whose affections were engaged in favour of the more amiable Balbinus. The two colleagues had both been consul... and, since the one was sixty and the other seventy-four years old, they had both attained the full maturity of age and experience. However, factions within the Senate who had hoped to profit from the accession of the Gordians manipulated the people and the Praetorian Guard to agitate for the elevation of Gordian III as their imperial colleague. Leaving his senior colleague Balbinus in charge of the civil administration at Rome, sometime during late April Pupienus marched to Ravenna, where he oversaw the campaign against Maximinus, recruiting German auxiliary troops who had served under him whilst he was in Germania; after the latter was assassinated by his soldiers just outside Aquileia he despatched both Maximinus's troops and his own back to their provinces (along with a considerable donative) and returned to Rome with his newly acquired German bodyguard. Balbinus, in the meantime, had failed to keep public order in the capital. The sources suggest that Balbinus suspected Pupienus of using his newly acquired German bodyguard to supplant him, and they were soon living in different parts of the Imperial palace. This meant that they were at the mercy of disaffected elements in the Praetorians, who resented serving under Senate-appointed emperors, and now plotted to kill them. Pupienus, becoming aware of the threat, begged Balbinus to call for the German bodyguard. Balbinus, believing that this news was part of a plot by Pupienus to have him assassinated, refused, and the two began to argue just as the Praetorians burst into the room. Both emperors were seized and dragged back to the Praetorian barracks where they were tortured and brutally hacked to death in the bath house. Pupienus had at least three children. His eldest son, Tiberius Clodius Pupienus Pulcher Maximus, was a Consul Suffectus c. 235, and patron of the town of Tibur outside Rome. His youngest son, Marcus Pupienus Africanus Maximus, was Consul Ordinarius in 236 as colleague of the Emperor Maximinus Thrax. This run of consulships in the family, across the reigns of Severus Alexander and Maximinus Thrax, show that the family was influential and in high favour. Pupienus also had a daughter, named Pupiena Sextia Paulina Cethegilla, wife of Marcus Ulpius Eubiotus Leurus. ↑ In Classical Latin, Pupienus' name would be inscribed as MARCVS CLODIVS PVPIENVS MAXIMVS AVGVSTVS.